A Bosnian professional basketball player Jusuf Nurkic currently plays for the Portland Trail Blazers of the National Basketball Association (NBA). Nurkic plays the position as a Center. In the 2014 NBA draft, Nurkic was picked by the Chicago Bulls with the 16th overall pick. Likewise, he further played for Cedevita Zagreb and Denver Nuggets. Moreover, Nurkic is also a member of the Bosnian National Basketball team. For 2018-19, his salary is reported $11,111,111 and has an estimated net worth of $16 million. Neither married nor single, he is currently in a relationship with his girlfriend, Emina Duric. Jusuf Nurkic currently has an estimated net worth of around $16 million. From his career as a basketball player, Nurkic earns a fortunate amount of money. Previously he played for clubs including Cedevita Zagreb and Denver Nuggets. Currently, under 4 years $48 million contract with the Portland Trail Blazers, including $40 million guaranteed, and an annual average salary of $12 million, Nurkic will earn a base salary of $11,111,111, while carrying a cap hit of $11,111,111 and a dead cap value of $40,000,000, in 2018-19. Furthermore, his total NBA career earning is recorded at $19,584,416. 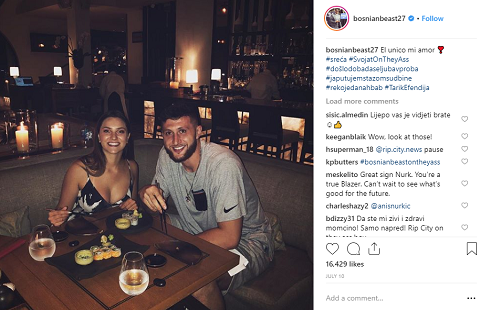 So far, Jusuf Nurkic is not married, however, he is currently dating his girlfriend Emina Duric who is from Tuzla, Bosnia. As per the source, his partner Emina was a candidate for Rotary Club in her hometown in 2014. The pair are happily enjoying their love life. They often spend their time together and Nurkic frequently shares adorable photos of his girlfriend on his Instagram. Along with his profession, Nurkic is successfully maintaining his love life too. Although the duo is dating, neither Nurkic nor Emina has mentioned any plans of getting engaged or married. So far, there are no rumors of their breakup and other affairs. Besides this, there are no records of Nurkic's past relationships. Aged 24, Jusuf Nurkic the handsome hunk stands the perfect height of 2.13 m i.e. 7 feet tall and weighs 125 kg which is 275 lbs. Jusuf Nurkic was born on 23rd August 1994, in Tuzla, Bosnia, and Herzegovina. 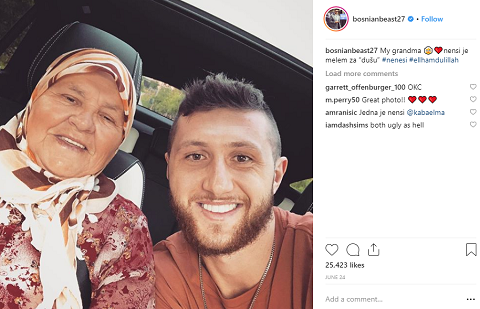 He was raised by his father Hariz Nurkic who is a police officer in Bosnia and Herzegovina. Nurkic grew up along with his brother Kenan Nurkic. Nurkic belongs to a Bosnian nationality. He completed his graduation from the Bosnia and Herzegovina college. Jusuf Nurkic began playing basketball at the age of 14. Initially, he played for Zlatorog Laško and later traded to Union Olimpija to play the Nike International Junior Tournament. Nurkic took training with Cedevita Zagreb for a few months signed a four-year contract with them. Nurkic averaged 1.8 points per game in the Euroleague for Zagreb. Similarly, in his second season, he averaged 11.6 points and 5.6 rebounds per game. Nurkic was even nominated for the FIBA Europe Young Player of the Year Award in 2014. In October 2014, Nurkic was drafted by Chicago Bulls with 16th overall pick in the 2014 NBA draft. However, Nurkic was traded to Denver Nuggets. He made his NBA debut on 29 October 2014 and recorded 5 points and 7 rebounds. During the 2016–17 season, Nurkic scored his career-high 23 points on 26th October 2016. Later, he was traded to Portland Trail Blazers in exchange of Mason Plumlee. In his debut match for Blazers, Nurkic recorded 13 points and seven rebounds. Nurkic re-signed a four-year contract with Blazers on 6th July 2018 and plays alongside C. J. McCollum, Seth Curry, Meyers Leonard, and others. Besides his NBA career, he is also the member fo Bosnian national basketball team.